As well as finding unwanted cats loving new homes, Cats Protection also reunites thousands of lost moggies with their relieved owners each year. This is made much easier if the cat is microchipped and its details are up to date as after a quick scan they can be back home within a day or two. 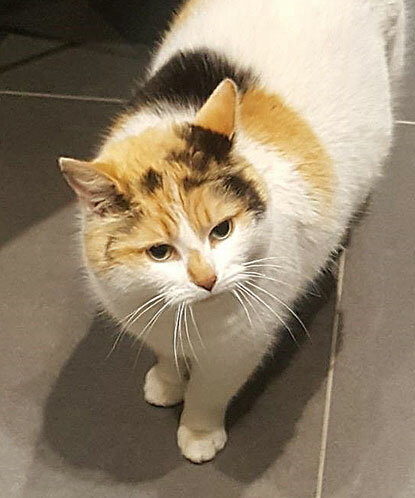 Without microchipping, Chloe, a 12-year-old white-and-tortoiseshell cat from Wales, could still be living as a stray on the streets while her owners worry about her at home. Chloe went missing the day after her owners moved from Ammanford to Skewen in 2014. Four years later, Mandy Hughes, a volunteer for Cats Protection’s Swansea Branch received a phone call about a stray cat. With a quick scan, Mandy was surprised to discover that the cat was microchipped and was in fact only a mile away from home. Delyth Thomas, Chloe’s owner, was ecstatic to receive the call to say her beloved moggy had been found. When she first went missing, she had put up posters in the area and posted messages on social media, but although she never received a response, she never gave up hope of finding her.